The President of the University Prof. Ali Zidan Abu Zuhri, welcomed the delegation from the Faculty of Science at An-Najah National University, who visited the university in order to know about the University's Faculty of Sciences and its specialties, labs, and scientific research activities. The delegation included a number of professors from the Faculty of Science at An-Najah University, headed by the Dean of the faculty Dr. Maan Ashtewe. The delegation was welcomed by the President of Arab American University, his deputy for training affairs Dr. Nizam Diab, the Dean of the Faculty of Science at the University Dr. Muayed Abu Saa, and PR Manger Fathi Amour. The guest delegation was introduced to the university and its future plans, and academic programs offered by the university in all levels doctorate, master's and bachelor's degrees, As Dr. Abu Zuhri pointed out that the university is developing programs that suits the local and regional labor market. The university focus on presenting high academic level and developing scientific research, in addition to serving the local community, and these are the main objectives of the university and seeks to develop them. He assured the university's interest and focus on developing its scientific laboratories in all faculties, especially the Faculty of Science, which is the starting point for all medical specialties and engineering and information technology disciplines, in addition to keen interest in scientific research and supports its faculty members and students, and specialize awards for scientific research. the Dean of the Faculty of Science at Al-Najah University praised the role of Arab American University, expressing their admiration of the academic level and the services provided for the students and the local community. He expressed his pride within the partnership between the two universities. 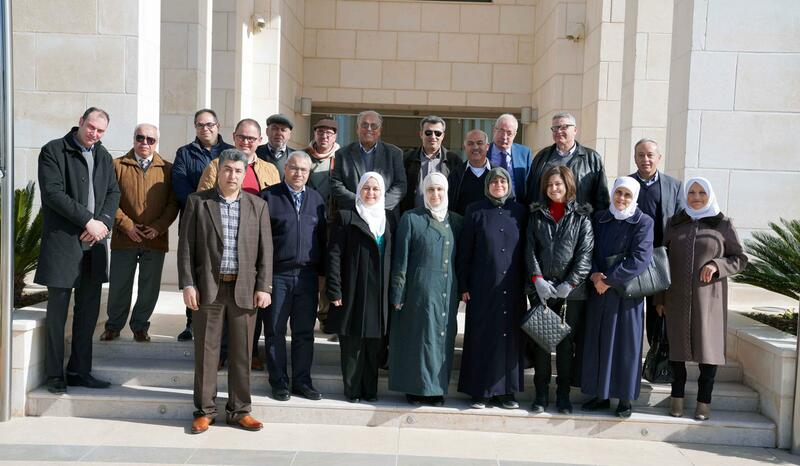 As they also took a tour in the university’s faculties and sites.